With the potential loss of Tyreek Hill this season of some games, all games, or even up to being cut as his teammate Kareem Hunt was last season, Patrick Mahomes takes a bit of a slide down the rankings. He's still the top QB in dynasty formats, but in redraft leagues, he's slid down to 3rd, behind Aaron Rodgers and Andrew Luck. Expecting 50 touchdowns is a difficult proposition, but losing a top target like Hill, even if Mahomes still has quality targets like Travis Kelce and Sammy Watkins around him, still hurts... Another big mover is Baker Mayfield, who with the Odell Beckham trade to Cleveland, undoubtedly becomes a locked-in QB1, and, unfortunately, somebody who could go too high in redraft leagues. Case in point: his ADP the last month. 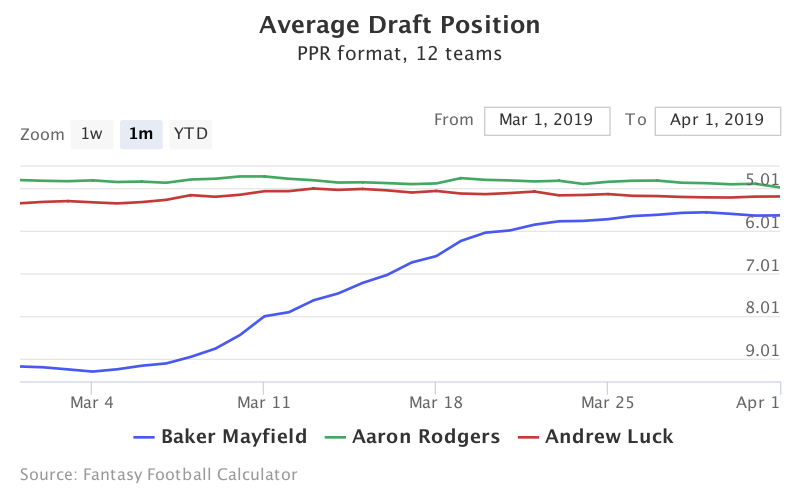 Over the last month, Mayfield has shot up to a Round 5 ADP, just below Rodgers and Luck. I can't justify spending that high draft capital on Mayfield in that rarefied air at the QB position... Other than the shakeups near the top of the rankings, there isn't much moving up and down the rankings as far as anything other that late-round picks, though Ben Roethlisberger did slide down slightly losing Antonio Brown as his favorite target. He's still a late-round QB to take as a backup or even a waiver wire find during the season, but at this point, it's hard to trust him as anything but a desperation starter or backup QB on deeper redraft benches. Todd Gurley's arthritic knee raises some long-term questions for the Los Angeles Rams, but in the short term, it could affect his redraft PPR prospects as well. Gurley had an excellent 14 game stretch in 2018 where he was the top running back in fantasy, and ended up as #1 in the end, but his questionable end to 2018 into the playoffs raises a looming shadow. For some intrepid fantasy owners (like myself), he's been sliding a little in running back rankings, down below Ezekiel Elliott and Saquon Barkley. There's a slight possibility of stem-cell treatments and even microfracture surgery so this is definitely news to monitor as the spring and summer approach... 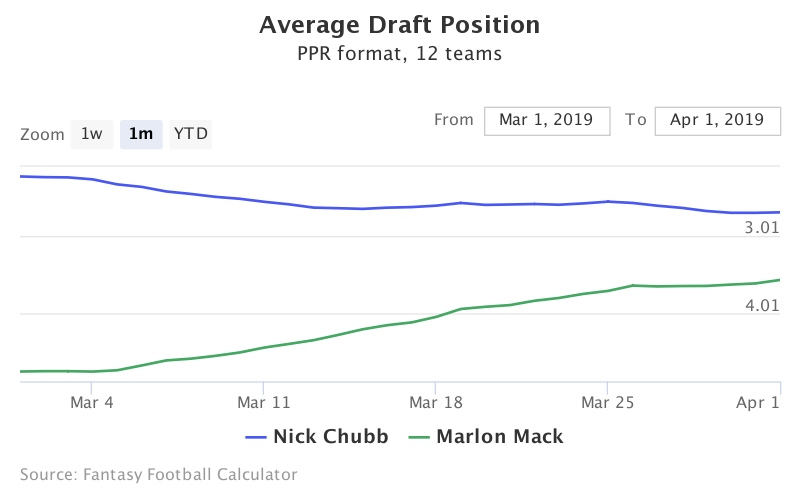 The suspension of Kareem Hunt for 8 games certainly affects Nick Chubb and come fantasy playoff time, any workload split could cripple Chubb's value for 2019. Thus, his rankings slide down to #14 in my PPR Rankings. He's still a 2nd round pick, but his ADP could slide down a bit further, perhaps into the 3rd round in some leagues... News came out this week that the Colts believe Marlon Mack "could be a bellcow", and if Mack is treated as such in 2019, he could be a dark horse (no pun intended) RB1 this season at a fairly reasonable price, for now. More additions to the top 30 running backs include new faces in new places like Ravens RB Mark Ingram, Saints RB Latavius Murray, 49ers RB Tevin Coleman, and Bears RB Mike Davis. Ingram has a great shot to be a high-end RB2 based on workload alone. Murray could see a good amount of volume in the Saints' heavy run offense as well as some goal-line work. Coleman is the leader of the Niners' triumvirate of running backs but who knows how that workload will be split up among Coleman, Jerick McKinnon, and Matt Breida. Lastly, Davis could be a sneaky RB2 even with Tarik Cohen in the offense as Davis' versatility is a better fit for Matt Nagy's offense than the recently traded Jordan Howard. Chris Godwin's price now that he is the unquestioned WR2 in a Bruce Arians offense has skyrocketed in the past couple weeks to the beginning of the 5th round. While Godwin is super talented and could be on to a full breakout, the "100 catches" quote from Bruce Arians is extremely hard to wrap my head around given the presence of Mike Evans and O.J. Howard also in the offense. Granted, there are targets up for grabs with the DeSean Jackson trade and free-agent departure of Adam Humphries, but having two elite top 20 fantasy receiving options on the same team is the exception, not the rule. Can the volume sustain it? Sure. 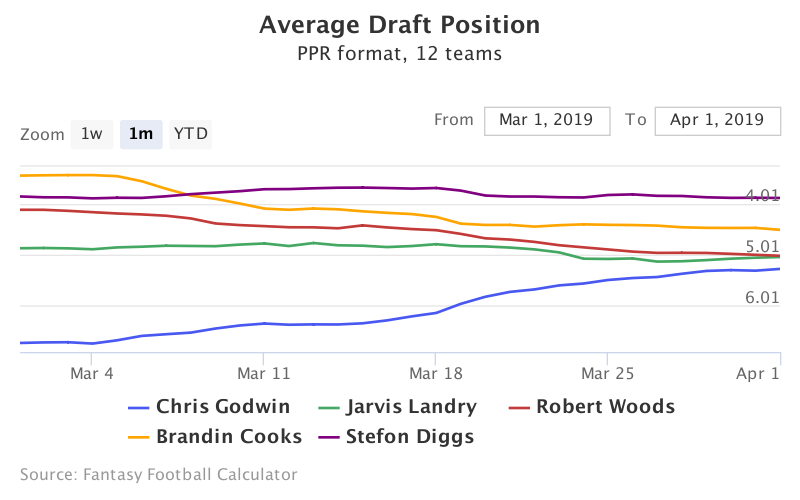 I just want to see it before I pay for it, and by the time drafts come around in August, Godwin could be up to a 4th round ADP, in line with players like Stefon Diggs, Robert Woods, and Brandin Cooks. Happy trails to Rob Gronkowski, who had a long and productive NFL career and is now out of my rankings. He's without a doubt a Pro Football Hall of Famer, but who knows, if the Patriots need him, would he answer the call? He'd be a top 10 option based on talent alone... I will continue to trumpet this off of the rooftops as long as I can, but Delanie Walker is the best value of any tight end thus far for 2019. Yes, he's going to be 35 years old at the start of the '19 season, yes, he's coming off of an ankle injury that sidelined him the entire 2018 season. That's the bad. The good? He finished as TE5 and TE4 as recently as 2016 and 2017, respectively. Early fantasy football underrated alert: Titans TE Delanie Walker. 800+ yards in 4 straight before last year's injury. Have him projected for his worst season since 2013 and it's still enough for TE6 numbers. Walker is definitely worth a late round pick in fantasy, especially in PPR and even in a shallow position, can be had in the 10th round or even later... Another beneficiary to the Antonio Brown trade and a portion the targets Brown leaves behind could be Vance McDonald. McDonald also benefits from losing Jesse James, who was his main competition at the position and now for the most part, has the position to himself to reap the fantasy benefits. He can be had in the same area as the aforementioned Walker, in the late rounds once the top 7-8 TE are off the board. With both, there is very little risk and potentially very high rewards. Even a marginal uptick of his career high in targets (72 in '18) could result in some gaudy numbers at the position, potentially a top 7-8 finish barring injury. Injury is a big concern for McDonald, who played 15 games last season, but has never played a full 16 game slate in his 6 years as a pro. Stay tuned to Fighting Chance Fantasy with much more coverage on baseball and football in the coming weeks as football gets closer to the NFL Draft and as the opening weeks roll on for the beginning of the 2019 baseball season!